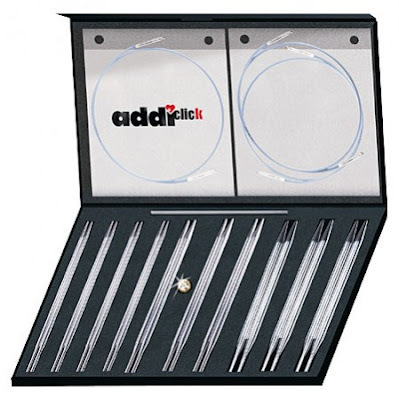 These are fantastic sets, with 10 different sizes of addi tips, 3 different lengths of cord and one connector piece. Simply insert the cord into the tip, then twist. The tip will remain secure until you change it. You guessed it, we didn’t receive many sets. The quantity ordered means nothing with a hot product like this. What can I say, we’re in Canada, eh? So it’s first come, first served and we’re pretty sure they’ll be sold out today. The first customers to arrive in Point Grey or phone with $179.95 plus tax will be among the first in Canada to own one of these coveted needle sets. If you miss out and are terribly disappointed, please accept our apologies – we’re disappointed too! Just put your name on your list and we promise to call when the next shipment arrives. This entry was posted on Friday, November 28th, 2008 at 2:16 pm	and is filed under Uncategorized. You can follow any responses to this entry through the RSS 2.0 feed. Both comments and pings are currently closed.